Written on 28 April 2015 . A video clip intended to promote Vovinam, Vietnam’s traditional martial art, to the world had its first scenes shot in Ho Chi Minh City on Monday. The promo video will star the same cast, including famous American actor Michael Madsen and former world heavyweight boxing champion Evander Holyfield, as a Hollywood movie filmmaker Ace Cruz is slated to begin filming later this year. The American Hollywood film director and H.E. Oknha Rat Sokhorn, who scripted the video, paid a visit to Vovinam master Nguyen Van Chieu at his home in District 8 to do the shooting. A high-ranking royal official in Cambodia, H.E. Oknha Rat Sokhorn is skillful at the Vovinam and is the co-producer of the video clip and the Hollywood film, “Fight for Life,” with Cruz. Chieu, who is also the deputy chairman of the World Vovinam Federation, is featured in the promo footage, where he is seen delivering a brief introduction about the martial art and send a greeting to Holyfield and Madsen. 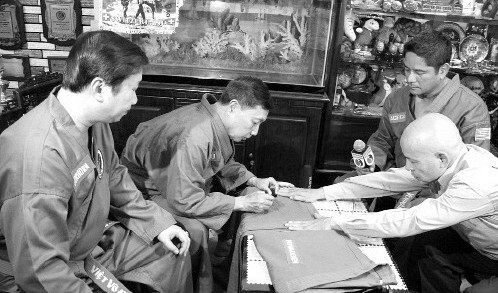 The martial artist is also filmed giving his autograph on two Vovinam uniform exclusively made for the former world heavyweight boxing champion and the American actor. Even though it is only a simple scene, in which Chieu only sat and talked, director Cruz requested that three cameras be deployed to capture the best pictures. “We are honor to see famous stars like Holyfield and Madsen know of and love Vovinam,” Chieu is heard speaking in the video. The film, which tells the story of a Cambodian boy who rises to fame thanks to the Vovinam ring, will be shot late this year with all martial art techniques being those of Vovinam. Cruz left Vietnam for the U.S. on Wednesday and will continue shooting the rest of the promotional video there. He will meet Holyfield on May 2, when they are both expected to watch the much-anticipated match between Manny Pacquiao and Floyd Mayweather in Las Vegas. The filmmaker said he has good relationship with both Holyfield and Pacquiao. He will hand over the Vovinam uniform with Chieu’s autograph to the former heavyweight boxer. Cruz admitted that it is more difficult to reach Madsen, who is busy with his filming schedule. But Cruz said he will manage to finish the promo footage by the end of June. The rbaining part of the video will show Holyfield and Madsen, wearing the Vovinam uniform they are gifted, sharing their thought about the Vietnamese martial art and encourage people to try practicing it, according to the screenplay. Holyfield is expected to tell viewers that as a seasoned boxer, he finds Vovinam techniques not only beautiful but also practical, and that he is happy to join the Vovivam family. The complete promotional video will be broadcast on the under-construction vovivamholywood.com website, and other sites, according to Cruz. The film director is hoping that the video will see positive reception before he moves on to make other Vovinam-thbed movies.